The wearable optical device known as Google Glass is getting another look as an aid for children with autism, CBS San Francisco reports. Annett Hahn-Windgassen must work daily with her 10-year-old son Erik on his social interaction skills. On any given day a visitor to their home might hear Annett urging her son, "Erik, can you please look at me? Can you look at me?" Erik is autistic. Until recently, this extremely intelligent, precocious boy seldom made eye contact with anyone, including his mother. Not knowing how to recognize other people's emotions made social interaction difficult for Erik. But now he's getting some help using Google Glass, the headset smartphone which has been used with different applications across a number of industries. Erik is among 100 children, aged 6 to 17 years old, who are taking part in a yearlong study by Stanford's Autism Glass Project. The project's research team developed software for Google Glass to help kids with autism read people's emotions. The software is based on a facial tracking program that helps kids match facial expressions with feelings by using colorful emoticons depicting sad, happy or mad faces. The emoticons are displayed inside the glasses in real time as a child is looking at another person's face. 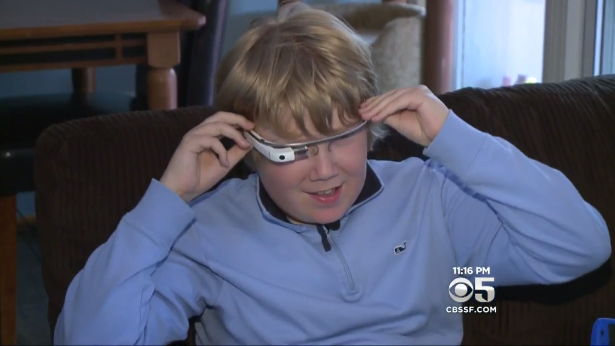 The Google Glass camera records what the child sees and sends that data to a smartphone app. Researchers, and parents, can then view the videos later. The researchers from the Autism Glass Project have been encouraged by the results and the data the headsets have provided. "We can literally jump back here and say, 'This was the angry moment,'" explained project founder Catalin Voss. "You look at me, the camera is tracking my face, and essentially it sends those frames to the phone, which does all the computation, and sends back the social cue." Program director Dennis Wall explained that children with autism can use the technology at home for about 20 minutes per session, several times a week. The potential accessibility could help many more kids, which Wall says is no small hurdle, since the average wait to see a therapist is eight to 12 months. According to the Centers for Disease Control and Prevention, one in 68 American children fall somewhere on the autism spectrum. "There are many kids in need and there are too few practitioners to provide the care that these kids need," said Wall. "We can reach rural populations, diverse socioeconomic groups. We can go global." And Stanford researchers say when Google Glass eventually goes back on the market -- complete with the specially-designed software -- they are hoping to make them reimbursable through health insurance. The team is looking for more volunteers for the study, headquartered in a lab at Stanford's pediatrics department. As for Erik, now that he's making more eye contact he is also making friends and showing more of his fun-loving self, much to the delight of his mother. "As soon as he was wearing the glasses, he made eye contact," said Hahn-Windgassen. "And it was almost like, 'Oh, wow! My son is looking at me!'"